Midway into the month, the July award for best corporate use of the media has been locked up. In a rare tie, the trophy goes jointly to Microsoft and Carl Icahn. Together, working with press releases, public letters and carefully worded position statements, the two have effectively served their dual purpose of destabilizing Yahoo and advancing their efforts to acquire the company (or its assets) against the wishes of its management. It wasn’t too long ago that Microsoft CEO Steve Ballmer had said Microsoft’s pursuit was over; that they had “moved on.” At the end of June, in an interview with Tom Brokaw to discuss his retirement, Bill Gates confirmed he didn’t think a Microsoft-Yahoo combination would happen either. Things changed last week. With two weeks until earnings (July 22nd) and about three weeks until the shareholders vote to determine the current board’s fate (August 1), the dead deal talk was replaced with a new buzz and fervor. Monday, another salvo was fired. More “he said, she said” was aired for public audiences. In one set of remarks, Icahn chastised Yahoo for rejecting a Friday offer that would have given Microsoft the Yahoo Search business and a 14 percent stake in the company (provided Yahoo also sells off Asian assets). Yahoo fired back that the offer was not fair value and released a slide presentation arguing their case. Microsoft tried to rebut that with a logic statement of their own. Back and forth. And more back and forth. Who are the good guys? Who are the bad? More importantly, in the end, will all the Public Relations banter and vitriol matter? There has been a lot of talk but this will boil down to who can show the shareholders the money, or where it will come from? The first substantive indicator of how that will most likely stem from Yahoo’s corporate earnings announcements on July 22. As discussed in an article by Kara Swisher from All things Digital on July 7, a lot of eyes will be watching the numbers that day. Yahoo’s execs have been working hard and using all the tricks in their arsenal to insure they meet and exceed forecasts. A shortfall would be dire. But even weak guidance, or just meeting the lower end of expectations could be enough to sway fence-post sitting investors who haven’t’ decided how they’ll vote. Already, Gordon Crawford, of Capital Research Global Investors, which holds 6.5% of the company, has challenged Yahoo’s strategic plan and threatened to vote with Icahn. Legg Mason (Yahoo’s 3rd largest shareholder) has hinted they, and others, might be swayed to vote with Icahn too, provided he promises to support a deal worth no less than $33 a share. Bill Gates didn’t think a deal would happen. Rupert Murdoch, who’s spoken with both sides repeatedly in this process, said this weekend he doesn’t think it will either. Friday, he predicted “in six months (Microsoft) will walk away.” There’s too much bad blood. It could go either way, but I’m inclined to agree with them. Shareholders won’t vote simply for change. They’ll vote for strategy and they’ll vote for results. If Carl Icahn is to win the proxy fight for control, he’ll have to convince shareholders he can provide a viable alternate plan to that offered by Yahoo management. Yahoo will have to show they can’t deliver results. For Microsoft to take the role of accepted buyer, they’re going to have to make Yahoo an offer for the whole company. Yahoo won’t sell search alone, not with current management in control. The two sides will also have to find a way to have a constructive dialogue over deal terms and contingencies. Given the animosity and bad blood, that’s hard to imagine. It’s hard to see these two sides burying the proverbial hatchet such that the same execs now fighting will work together. These aren’t professionals inclined to play with each other in the sandbox. 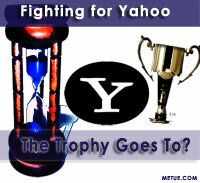 Besides, Microsoft doesn’t need to buy Yahoo to win (although getting search assets would be valuable for them). Here, for Microsoft, it’ll be a win whether Icahn succeeds or fails, it’ll be a win whether they acquire the company (or assets) or simply beat them up enough to gain further future advantage. So, the Trophy for Expert Use of the Media goes to…..Team Icahn and Microsoft. In related news… Tuesday Microsoft and Google will face each other before congress in a hearing to look at whether Google’s deal to partner with Yahoo on search is harmful to competition. Expect more quotes and media messages from all parties. Expect more headlines. Expect more PR.